You can sum up 90% of this week's 'Book Review with two words: MacBook Air, an ultralight notebook that has earned Apple tons of free publicity since it was unveiled on Tuesday. Is it right for you? That's the question we've been discussing at Low End Mac - and around the Web. Can Apple Justify MacBook Air's Value Proposition? MacBook Air: Who's Driving the Innovation Now? PR: Apple on Tuesday unveiled MacBook Air, claimed to be the world's thinnest notebook. MacBook Air measures an unprecedented 0.16" at its thinnest point, while its maximum height of 0.76" is less than the thinnest point on competing notebooks. "We've built the world's thinnest notebook - without sacrificing a full-size keyboard or a full-size 13-inch display," said Steve Jobs, Apple's CEO. "When you first see MacBook Air, it's hard to believe it's a high-performance notebook with a full-size keyboard and display. But it is." MacBook Air has a vibrant 13.3" LED-backlit glossy widescreen display that is energy efficient, and its spacious trackpad offers multitouch gesture support for pinch, rotate and swipe, making it more intuitive than ever to browse and rotate photos or zoom into web pages in Safari. MacBook Air features a full-size keyboard design in a sleek and durable aluminum enclosure. The backlit keyboard makes it ideal for dimly lit environments such as airplanes, studios or conference halls, and a built-in ambient light sensor automatically adjusts the brightness of the keys as well as the display brightness for optimal visibility. MacBook Air delivers up to five hours of battery life for wireless productivity and includes AirPort Extreme 802.11n WiFi networking, which delivers up to five times the performance and twice the range of 802.11g*. Apple's Migration Assistant software now enables users to quickly transfer files, applications and preferences from your old Mac to MacBook Air right over your wireless network. MacBook Air users can buy the companion MacBook Air SuperDrive, a compact external drive designed for MacBook Air, for just $99. The MacBook Air SuperDrive is powered by MacBook Air's USB port, eliminating the need to carry a separate power adapter. Many MacBook Air users will not find a need for an optical drive now that they can wirelessly rent movies from the iTunes Store, wirelessly backup files with Time Capsule and access the optical drives on remote PCs or Macs to wirelessly install software applications on MacBook Air. MacBook Air is powered by Intel Core 2 Duo processors running at 1.6 GHz or 1.8 GHz, and includes as standard 2 GB of memory and an 80 GB 1.8" hard drive. An optional 64 GB solid state drive contains no moving parts for added durability. Every MacBook Air includes a micro-DVI port so users can connect to Apple's gorgeous 20-inch or 23-inch Cinema Displays to extend their desktop or connect to projectors and other displays via DVI, VGA, Composite and S-video adapters. MacBook Air includes USB 2.0 for plugging in peripherals or charging an iPod or iPhone, a headphone jack and Apple's acclaimed MagSafe Power Adapter designed especially for mobile users. Every MacBook Air comes with iLife '08, the most significant update ever to Apple's award-winning suite of digital lifestyle applications, featuring a major new version of iPhoto and a completely reinvented iMovie, both seamlessly integrated with the new .mac Web Gallery for online photo and video sharing. The new MacBook Air also comes with Leopard, the sixth major release of the world's most advanced operating system. Leopard introduces Time Machine, an effortless way to automatically back up everything on a Mac; a redesigned Finder that lets users quickly browse and share files between multiple Macs; Quick Look, a new way to instantly see files without opening an application; Spaces, an intuitive new feature used to create groups of applications and instantly switch between them; a brand new desktop with Stacks, a new way to easily access files from the Dock; and major enhancements to Mail and iChat. .mac members can use the new Back to My Mac feature to browse and access files on their home computer from a MacBook Air over the Internet while out on the road. 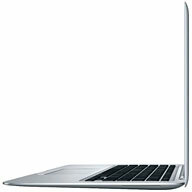 The new MacBook Air embodies Apple's continuing environmental progress with its aluminum enclosure, a material highly desired by recyclers; Apple's first mercury-free LCD display with arsenic-free glass; and brominated flame retardant-free material for the majority of circuit boards as well as PVC-free internal cables. In addition, MacBook Air consumes the least amount of power of any Mac, and its retail box, made primarily from 100 percent post-consumer recycled material, is 56 percent smaller by volume than the previously smallest MacBook packaging. Build-to-order options and accessories include the ability to upgrade to a 1.8 GHz Intel Core 2 Duo processor; 64 GB solid state drive, MacBook Air SuperDrive, Apple USB Ethernet Adapter, Apple USB Modem, Apple MagSafe Airline Adapter, Apple Remote and the AppleCare Protection Plan. Additional build-to-order options also include preinstalled copies of iWork '08, Logic Express 8, Final Cut Express 4 and Aperture 1.5. *Battery life depends on configuration and use. See www.apple.com/batteries for more information. AirPort Extreme is based on an IEEE 802.11n draft specification. Actual performance will vary based on range, connection rate, site conditions, size of network and other factors. "I'm getting a number of questions about the new processor in the MacBook Air, so here's my quick take on what this processor may be. "The first question that has to be answered about the CPU is which process is it made on. There's a possibility that it could be made on Intel's new 45nm process. Intel just launched 16 new 45nm desktop and server processors last week, and the company is set to launch the mobile portion of its 45nm line on January 20th. Given that the MacBook Air will be available in two weeks, it's possible that this it could sport a Penryn mobile processor." "Having taken some stick for allegedly poor environmental practices (though that was as much about communication as actual performance), Apple has played up the green aspects of its latest model. "The company has drawn attention to the fact that the new MacBook Air lightweight notebook is fitted with a screen that uses LED backlighting. Traditional panels have fluorescent backlights, which contain small amounts of mercury. LED lamps also use less power, and Apple boasts that the MacBook Air uses less power than any other Mac." "...The MacBook Air is an attempt to fill a gap, and with the iPhone now having reportedly sold 4 million units by Apple's numbers, that gap is smaller now than ever before. "Although from certain angles it's certainly beautiful, from a practical perspective, the MacBook Air may not be that much of a standout. It has some classic elements of Apple innovation, including a touch pad that recognizes gestures similar to what the iPhone recognizes, and a mere 3 pounds of weight. But for the type of applications that define a Macintosh as opposed to a mere iPhone, an 80 GB hard drive will not be enough. And its Remote Drive concept - which borrows the machine's built-in 802.11n WiFi link to connect with another nearby device, including a Windows PC, for borrowing its optical disc - runs the risk of turning the Air into an $1800 peripheral." Link: Inside the MacBook Air: Can Apple Justify Its Value Proposition? "Fast forward to 2008 and Apple announced the wireless MacBook Air, a ultralight low power laptop with no CD or dvd drive, no hard disk, but highly connected portable computer. In a few years this will probably be the industry standard, but this time around it's not Cupertino who's setting it. "Granted, one cannot compare the $199 XO to a $1,799 MacBook anymore than one can compare the recently announced $2,500 Nano Car by India's Tata motor to a $50,000 Porsche, unless on technological grounds. And that is what I'm going to do." Link: The Apple Ultrathin: Who's Driving the Innovation Now? "So Macworld is going on now, and as usual Steve Jobs has caused a fervor on the tech community with his powerful salesmanship. Love or hate Macs, you have to hand it to him-the guy can sell. There's plenty to talk about, from Apple senselessly gouging iPod Touch customers for $20 to enable apps that should be on there for free, the cool (and welcome) software updates to the Apple TV, to the new iPhone firmware we all sort of knew about that still doesn't add MMS support. But the big news is the MacBook Air. "It sounds almost too good to be true. A 13-inch MacBook that is so thin and light it fits into a manila envelope! Finally, you'll be able to carry around just a super-thin three pound notebook, saving your back, and your luggage space, and all that good stuff. Right? "Then the gotchas set in." "...MacBook Air won't be a total bust, but it's not the gee-whiz home run that most folks I know wanted from a Mac subnotebook. I'm pretty sure the footprint of my Duo 280 is smaller than Air's footprint. That is to say that Air is more a flattened out, compromised MacBook than it is a truly new genre of machine from Apple. It's no Vaio TZ, Eee PC, or Everex Cloudbook that weighs two pounds and fits in a coat pocket. Instead it's a very thin MacBook that's also very light. Which is great. But not as it could have been." "The hottest mobile products of the moment? Undoubtedly, Apple's MacBook Air and Asus' Eee PC. So how do these would-be pinnacles of ultra-portability compare? "Let's take a look at the features each machine offers...."
"If your MacBook Air requires service only because the battery's ability to hold an electrical charge has diminished, Apple will repair your MacBook Air for a service fee. "...Many repairs require Apple to replace or reformat the hard disk, which will result in the loss of your data. Please make sure you back up your data on a regular basis to minimize your data loss. "The repair process normally takes 5 business days." "On Monday Intel announced the first mobile quad-core processor called Penryn. The new silicon is the cousin to the Penryn desktop processor, the Core 2 Extreme QX9650, announced on 12 November 2007. "The next generation transistors, used in the new Penryn processors (Intel Core 2 Duo, Intel Core 2 Quad and Xeon family) feature 'new high-k + metal gate material that will allow for higher frequencies, lower resistance, less leakage and lower power consumption.'" "The scientist who designed a notebook computer for poor children that is being produced and sold by a nonprofit foundation has set up a company to commercialize the technology with a goal of producing a $75 laptop computer. "Mary Lou Jepsen, who left her post as chief technology officer of the One Laptop per Child Foundation at the end of last year, said on the company's Web site that she has founded the company, called Pixel Qi, and described it as 'a spin-out' from the nonprofit group." PR: Tom has just completed the pattern for the new Size 6X Horizontal and Vertical Brain Cell laptop cases, designed specifically to fit the new unbelievably thin MacBook Air laptop introduced today by Apple. The Size 6X Brain Cells are available for pre-order now with a shipping date of late February. The Size 6X Horizontal Brain Cell will clip securely inside our ID, Ego, and Super Ego messenger bags, Empire Builder and Zephyr briefcases, Western Flyer travel/overnight convertible briefcase, and Brain Bag backpack, or slip inside your current briefcase or messenger bag. The Size 6X Vertical Brain Cell will clip securely inside of the Brain Bag backpack or slip inside your current backpack. The TOM BIHN Brain Cell laptop case has gained a reputation for offering the best protection one can get for their laptop. For more information on the protective qualities of the Brain Cell, visit the Brain Cell page. Size 6X Horizontal or Vertical Brain Cell. $60. Available for pre-order now. Ships late February. For more deals on current and discontinued models, see our MacBook deals, MacBook Air deals, MacBook Pro deals, 12" PowerBook G4 deals, 15" PowerBook G4 deals, 17" PowerBook G4 deals, titanium PowerBook G4 deals, iBook G4 deals, PowerBook G3 deals, and iBook G3 deals.